Common Name : Malabar Tamarind, Brindall Berry, Chikana Red Mango, Mangosteen. Habitat : Commonly found in the evergreen and shola forests of western ghats in india up to 6,000 ft. high. Uses : The dried rind of cambodge is used as a condiment of flavouring curries in Kerala. 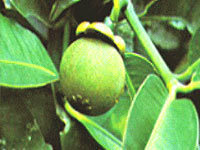 In Sri Lanka, the fruits are picked under-ripe, the thick pericarp cut into sections. It is used along with salt in the curing of fish. It is rich in acids and possesses marked antiseptic properties. The dried rind is also used for polishing gold and silver and as a substitute for acetic and formic acids in the coagulation of latex. A decoction of the fruit rind is given in rheumatism and bowel complaints. It is also used as a rinse for some veterinary diseases. An yellow translucent resin from the tree is soluble in turpentine and gives an yellow varnish. It reduces blood fat levels and increase metabolism and thus used for weight loss. Garcinia also contains significant amounts of Vitamin C and has been used as a heart tonic.